Aristotle's Rhetoric (Greek: Ῥητορική; Latin: Ars Rhetorica) is an ancient Greek treatise on the art of persuasion, dating from the 4th century BC. The English title varies: typically it is titled Rhetoric, the Art of Rhetoric, or a Treatise on Rhetoric. Like the other works of Aristotle that have survived from antiquity, the Rhetoric seems not to have been intended for publication, being instead a collection of his students' notes in response to his lectures. The treatise shows the development of Aristotle's thought through two different periods while he was in Athens, and illustrates Aristotle's expansion of the study of rhetoric beyond Plato's early criticism of it in the Gorgias (ca. 386 BC) as immoral, dangerous, and unworthy of serious study. Plato's final dialogue on rhetoric, the Phaedrus (ca.370 BC), offered a more moderate view of rhetoric, acknowledging its value in the hands of a true philosopher (the "midwife of the soul") for "winning the soul through discourse." This dialogue offered Aristotle, first a student and then a teacher at Plato's Academy, a more positive starting point for the development of rhetoric as an art worthy of systematic, scientific study. The study of rhetoric was contested in classical Greece: on the one side were the Sophists, and on the other side were Socrates, Plato, and Aristotle. The trio saw rhetoric and poetry as tools that were too often used to manipulate others by manipulating emotion and omitting facts. They particularly accused the sophists, including Gorgias and Isocrates, of this manipulation. 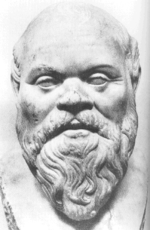 Plato, particularly, laid the blame for the arrest and the death of Socrates at the feet of sophistical rhetoric. In stark contrast to the emotional rhetoric and poetry of the sophists was a rhetoric grounded in philosophy and the pursuit of enlightenment. One of the most important contributions of Aristotle's approach was that he identified rhetoric as one of the three key elements—along with logic and dialectic—of philosophy. Indeed, the first line of the Rhetoric is "Rhetoric is a counterpart (antistrophe) of dialectic." According to Aristotle, logic is concerned with reasoning to reach scientific certainty while dialectic and rhetoric are concerned with probability and, thus, are the branches of philosophy that are best suited to human affairs. Dialectic is a tool for philosophical debate; it is a means for skilled audiences to test probable knowledge in order to learn. Conversely, rhetoric is a tool for practical debate; it is a means for persuading a general audience using probable knowledge to resolve practical issues. Dialectic and rhetoric create a partnership for a system of persuasion based on knowledge instead of upon manipulation and omission. Aristotle first defines rhetoric as the counterpart (antistrophos) of dialectic (Bk. 1:1:1-2). He explains the similarities between the two but fails to comment on the differences. Here he introduces the term enthymeme (Bk. 1:1:3). 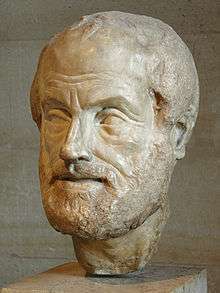 Aristotle's famous definition of rhetoric is viewed as the ability in any particular case to see the available means of persuasion. He defines pisteis as atechnic (inartistic) and entechnic (artistic). Of the pisteis provided through speech there are three parts: ethos, pathos, and logos. He introduces paradigms and syllogisms as means of persuasion. Aristotle discusses the different ethical topics of deliberative rhetoric. Aristotle identifies the goal of human action with “happiness" and describes the many factors contributing to it (Bk. 1:5:5-18). This is a continuation of Chapter Five, explaining in greater detail the stoikhea (elements) of the “good" described in the previous chapter. Introduces the term koinon of degree. Discusses the 'ends' of deliberative rhetoric in relation to the greater good or more advantageous. Aristotle defines and discusses the four forms of politeia (constitution) useful in deliberative rhetoric: democracy, oligarchy, aristocracy, and monarchy. Discusses what syllogisms should be derived from kategoria (accusations) and apologia (defenses) for judicial rhetoric. Also introduces the wrongdoing, which is useful for judicial rhetoric. This chapter parallels the koinon described in Chapter Seven. Aristotle is clarifying the magnitude in relation to questions of “wrongdoing" meant for judicial rhetoric. Aristotle summarises the arguments available to a speaker in dealing with evidence that supports or weakens a case. These atechnic pisteis contain laws, witnesses, contracts, tortures, and oaths. Book II gives advice for all types speeches. Aristotle's Rhetoric generally concentrates on ethos and pathos, and as noted by Aristotle, both affect judgment. Specifically, Aristotle refers to the effect of ethos and pathos on an audience since a speaker needs to exhibit these modes of persuasion before that audience. In Chapter 1, Aristotle notes that emotions cause men to change their opinion in regard to their judgments. As such, emotions have specific causes and effects (Book 2.1.2-3). Thus, a speaker can employ his understanding as a stimulus for the sought emotion from an audience. However, Aristotle states that along with pathos, the speaker must also exhibit ethos, which for Aristotle encompasses wisdom (phronesis), virtue (arete), and good will (eunoia) (Book 2.1.5-9). Chapters 2-11 explore those emotions useful to a rhetorical speaker. Aristotle provides an account on how to arouse these emotions in an audience so that a speaker might be able to produce the desired action successfully (Book 2.2.27). Aristotle arranges the discussion of the emotions in opposing pairs, such as anger and calmness or friendliness and enmity. For each emotion, Aristotle discusses the person’s state of mind, against whom one directs the emotion, and for what reasons (Book 2.1.9). It is pertinent to understand all the components in order to stimulate a certain emotion within another person. For example, to Aristotle, anger results from the feeling of belittlement (Book 2.2.3-4). Those who become angry are in a state of distress due to a foiling of their desires (Book 2.2.9). The angry direct their emotion towards those who insult the latter or that which the latter values. These insults are the reasoning behind the anger (Book 2.2.12-27). In this way, Aristotle proceeds to define each emotion, assess the state of mind for those experiencing the emotion, determine to whom people direct the emotion, and reveal their reasoning behind the emotion. The significance of Aristotle’s analysis stems from his idea that emotions have logical grounding and material sources. George A. Kennedy in On Rhetoric: A Theory of Civic Discourse remarks that ethos predominantly refers to the “moral character" of actions and mind. On page 148, Kennedy reveals the purpose of chapters 12-17 as a demonstration to the speaker of “how his ethos must attend and adjust to the ethos of varied types of auditor if he is to address them successfully." As seen in the chapters explaining the various emotions, in chapters 12-17 Aristotle focuses on the necessary means of successfully persuading an audience. Yet, in these chapters, Aristotle analyzes the character of different groups of people so that a speaker might adjust his portrayed ethos in order to influence the audience. First, he describes the young as creatures of desire, easily changeable and swiftly satisfied. The young hate to be belittled because they long for superiority (Book 2.12.1-15). According to Aristotle, the old are distrustful, cynical, and small-minded for unlike the young their past is long and their future short (Book 2.13.1-5). The old do not act on a basis of desire but rather act for profit (Book 2.13.13-14). Those in the prime of life represent the mean to Aristotle, possessing the advantages of both old and young without excess or deficiency (Book 2.14.1). One of good birth, wealth, or power has the character of a lucky fool, a character in which insolence and arrogance breed if these good fortunes are not used to one’s advantage (Book 2.15-17). Although Book II primarily focuses on ethos and pathos, Aristotle discusses paradigm and enthymeme as two common modes of persuasion. There exist two kinds of paradigm: comparisons, referencing that which has happened before, and fables, inventing an illustration (Book 2.20.2-3). Maxims, or succinct, clever statements about actions, serve as the conclusion of enthymemes (Book 2.1-2). In choosing a maxim, one should assess the audience views and employ a fitting maxim (Book 2.21.15-16). Amplification and deprecation, although not elements of an enthymeme, can contribute to refuting an opponent’s enthymeme or revealing a falsehood by exposing it as just or unjust, good or evil, etc. Aristotle also mentions the koina, fallacious enthymemes, and lysis (the refutation of an opponent’s enthymeme). In all of these techniques, Aristotle considers popular wisdom and audiences as a central guide. Thus, the speaker’s effect on the audience serves as a key theme throughout Book II. Book III of Aristotle’s Rhetoric is often overshadowed by the first two books. While Books I and II are more systematic and address ethos, logos, and pathos, Book III is often considered a conglomeration of Greek stylistic devices on rhetoric. However, Book III contains informative material on lexis (style) which refers to the “way of saying" (in Chapters 1-12) and taxis, which refers to the arrangement of words (in Chapters 13-19). Highlights arête, which is defined as virtue or excellence. When applied to rhetoric, arête means natural rather than forced or artificial (Bk. 3 2:1-4). Metaphors are also addressed as a skill that cannot be taught and should bestow “verbal beauty" (Bk. 3 2:6-13). Covers the necessary parts of a speech which include the prosthesis (which is the statement of the proposition) and then the pistis (which is the proof of the statement), along with the prooemium (introduction) and epilogue (Bk.3 13:1-4). ↑ Ars Rhetorica. Edited by W. D. Ross. OCT. Oxford: Oxford UP, 1959. ↑ Bizzell, P. and Bruce Herzberg. (2000). The Rhetorical Tradition: Readings from Classical Times to the Present. NY: Bedford/St. Martin's. p. 3. ↑ Golden, James L., Goodwin F. Berquist, William E. Coleman, Ruth Golden and J. Michael Sproule (eds.). (2007). The rhetoric of Western thought: From the Mediterranean world to the global setting, 9th ed. Dubuque, IA (USA): p.67. ↑ Gross, Alan G. and Arthur E. Walzer. (2000). Rereading Aristotle's Rhetoric. Carbondale, IL (USA): Southern Illinois University Press: p.ix. Gross and Walzer further say that "There is no comparable situation in any other discipline: No other discipline would claim that a single ancient text so usefully informs current deliberations on practice and theory."(p.x). ↑ Murphy, John J. (1983). "Introduction, " Peter Ramus, Arguments in Rhetoric against Quintilian. C. Newlands (trans. ), J. J. Murphy (ed.). DeKalb IL (USA): Univ. of Illinois Press. ↑ Gross and Walzer, 2000, p.ix. ↑ Griswold, Charles. "Plato on Rhetoric and Poetry", Stanford Encyclopedia of Philosophy, December 22, 2003. ↑ Gorgias, 465a, Perseus Project. ↑ Jebb, Richard C. (trans.) (1909). The Rhetoric of Aristotle. Cambridge: University Press. ↑ Freese, John H. (trans.) (1924). Aristotle, The Art of Rhetoric. With Greek text. Cambridge: Loeb Classical Library/Harvard University Press. ↑ Roberts, W.Rhys (trans). (1924). Rhetorica: The Works of Aristotle, Vol.11. Oxford: Clarendon Press. Rpt. 1954 in Aristotle, "Rhetoric" and "Poetics" (trans. Roberts and Ingram Bywater). New York: Modern Library. ↑ Cooper, Lane (trans). (1932/1960). The Rhetoric of Aristotle. New York: Appleton-Century-Crofts. ↑ Kennedy, George A. (trans./ed.). 1991. Aristotle 'On Rhetoric': A Theory of Civic Discourse. New York/Oxford: Oxford University Press. ↑ van Noorden, Sally. "A translation of Aristotle's Rhetoric," The Classical Review, 1993, 43.2, pp. 251-252. ↑ Wichelns, H. (1925/1958). 'The Literary Criticism of Oratory' in D.C.Bryant (ed.) The Rhetorical Idiom: Essays in Rhetoric, Oratory, Language, and Drama. D.C.Bryant (ed.). Rpt. Ithaca NY (USA): Cornell University Press. p.5-42. ↑ Foss, Sonja J. (1989). Rhetorical criticism: Exploration and practice. Prospect Heights IL (USA): Waveland Press. pp. 71 and 75. ↑ Garver, Eugene. "Aristotle on the Kinds of Rhetoric". Rhetorica: A Journal of the History of Rhetoric. 27 (1): 1–18. doi:10.1525/rh.2009.27.1.1. ↑ Garver, Eugene (Winter 2009). "Aristotle on the Kinds of Rhetoric". International Society for the History of Rhetoric. 27 (1): 1–18. doi:10.1525/rh.2009.27.1.1. ↑ Aristotle. On Rhetoric: A Theory of Civic Discourse. Trans. George A. Kennedy. 2nd ed. New York: Oxford University, 2007. Print. ↑ Graff, Richard (2005). "Prose versus Poetry in Early Greek Theories of Style". Rhetorica. University of California Press. 23 (4): 303–335. doi:10.1525/rh.2005.23.4.303. JSTOR 20135896. ↑ Rorty, Amelie (1996). "Exemplary Rhetorical Speeches". Essays on Aristotle's Rhetoric. Berkeley: University of California. p. 6. ↑ Yack, Bernard (2006). "Rhetoric and Public Reasoning: An Aristotelian Understanding of Political Deliberation". Political Theory. p. 421. Rapp, Christof. "Aristotle's Rhetoric". Stanford Encyclopedia of Philosophy.